Epic old school show Aug 4: Naughty By Nature, DJ Kool, Flav, and C&C! – HOT102, Milwaukee's Party Station for Old School! 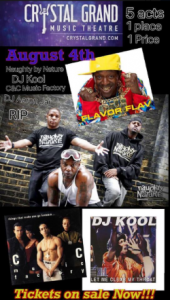 Epic old school show Aug 4: Naughty By Nature, DJ Kool, Flav, and C&C! Out in Wisconsin Dells, the Crystal Grand Music Theatre is hosting an epic show August 4th, featuring Naughty By Nature, DJ Kool, C&C Music Factory, and Public Enemy’s own Flava Flav! Tickets are still available for this show, which will include great HOT102 faves like “O.P.P.“, “Hip-Hop Hooray“, “Let Me Clear My Throat“, “Gonna Make You Sweat (Everybody Dance Now)“, and all of the Public Enemy and Flava Flav songs you loved back in the day. Get your tickets here, and sporting a HOT102 t-shirt there makes everyone know you’re legit. Keep up-to-date on these and other great shows in and around Milwaukee and Wisconsin by following HOT102 on Facebook, Twitter, or by just coming to our site often. And listen to our HOT102 online stream every chance you can! This entry was posted in Features by HOT102Radio. Bookmark the permalink. Next → Next post: VIDEO: 2 Live Crew on Phil Donahue?? Wow!